We hope everyone likes the photo of Aidan we are including with our Christmas card this year. PS we may not have your address so please send me it by email to kiczek@kiczek.com. And we will be sure to send you a card. Aidan is praying for you both. God bless you with much love- as you blessed Aidan with your love! The picture of Aidan and the saying are so beautiful. I know that today will be hard for you. It is hard for me. 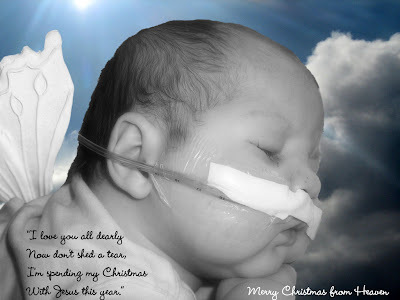 I was searching for Christmas card ideas and saw this one... What a beautiful little angel. I cannot stop my tears right now, what a loving family that little boy has, and oh the love he has shown and taught. I am a new mommy and thankful every day for my little girl. I wish you the best this year! Happy Holidays!